This set of Concrete Technology online quiz focuses on “Mass Concrete and Chemical Action – Sulphate Attack”. Explanation: Segregation in concrete is commonly thought as separation of some size groups of aggregates from cement mortar in isolated locations with corresponding deficiencies of these materials in other locations. 2. The separation of water or water-cement mixture from the freshly mixed concrete is known as bleeding. Explanation: The separation of water or water-cement mixture from the freshly mixed concrete is known as bleeding. Explanation: The continuous strain, which the concrete undergoes due to application of external loads, is called creep. Explanation: It is the rough finishing property of concrete and causes improper proportioning, less compaction, low water content, excess of medium sized aggregates, deficiency of sand etc. 5. In order to avoid segregation, the concrete should not be thrown from a height. Explanation: In order to avoid segregation, the concrete should not be thrown from a height of 100 cm. Explanation: According to IS 456:2000, Reinforced cement concrete is equally strong in taking Tensile, compressive and shear stresses. Explanation: Plain cement concrete is strong in taking compressive stress and week in tensile stress. 8. How many types of sulphates attack occur in concrete? Explanation: There are two types of sulphates attack in concrete and mortar i.e., internal attack and external attack. 9. What is internal sulphates attack? Explanation: Internal sulphates attack are rarer but originates from such concrete-making materials. 10. What is internal sulphates attack? Explanation: Internal sulphates attack are rarer but originates from such concrete-making materials like Presence of natural gypsum in the aggregates. 11. What is external sulphates attack? Explanation: External sources of sulphate are very common and are usually are a result of high-sulphate soils and ground waters or can be result into industrial pollution. 12. Fly ash affects the sulphate attack. True or False? Explanation: The addition of a pozzolanic admixture e.g. fly ash. It reduces the C3A content of cement which cause sulphates attack. 13. Low w/c ratio helps to control suphate attack. True or False? Explanation: Low water cement ratio directly cause low permeability which is the best protection towards sulphate attack. 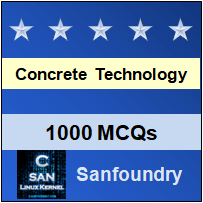 To practice all areas of Concrete Technology for online Quizzes, here is complete set of 1000+ Multiple Choice Questions and Answers.